The first days of sunlight this season (medio March) is seeing on the mountainside opposite the small town Longyearbyen at Svalbard . The settlement itself is still in the shadow from mountains in the back of town. In front we have the city center with a small shopping arcade, hotels and a mini university. 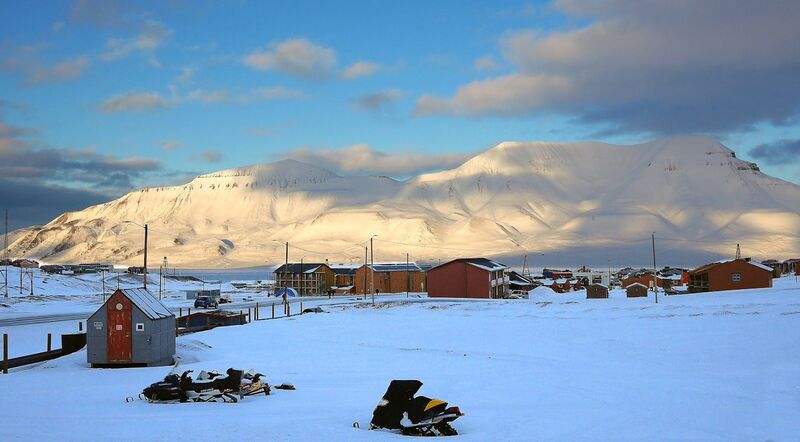 Longyearbyen is the largest populated settlement on the Svalbard archipelago, located in the high Norwegian Arctic. The settlement is generally regarded as the northernmost town in the world as well as the most easily accessed frontier in the Arctic, and is an ideal base for the greater exploration of Svalbard and the high Arctic. The settlement is named after American entrepreneur John Munro Longyear (1860-1922), who as head of the Arctic Coal Company founded the town and the neighboring coal mine, the first large mine on Svalbard. With approximately 2,000 inhabitants, the town is the de facto "capital" of the islands, and is today a vibrant, modern, and international settlement with much of the character of mainland Norwegian towns. It features an airport, a school, a shopping center, hospital, hotels, restaurants, and a university. People from approximately 40 different countries call Longyearbyen home, and this is reflected in the events offered in the town.